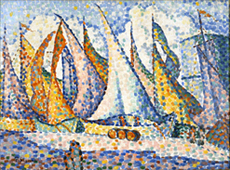 Proceeds from the Gala support the exhibitions of works such as this painting by French artist Paul Signac. The University of Wyoming Art Museum will host its 17th annual benefit ball, "Gala 2009: A Highland Fling," Saturday, Oct. 24, at 6 p.m. in the Wyoming Union Yellowstone Ballroom. The event will include both silent and live auctions, gourmet dining and dancing to live music performed by Play It Forward. Individual tickets are available for $175, as are table sponsorships at various levels, and can be purchased by calling the Art Museum at (307) 766-3477. The Gala Benefit Ball is held annually to provide funds for the Art Museum's exhibitions, education, collection and outreach programs that support nationally renowned and culturally significant exhibitions and programs for Wyoming and the surrounding area. "Many unique items will be up for grabs during this year's live auction, including a wonderful log dog house, paintings and art photographs"says Shantana Judkins, publicist for the Art Museum. "Special items this year will be experiences from going deep under the earth to explore the FMC mine to enjoying a 'Chef's Table' at the new Cavalryman Supper Club." Two raffles will also be held. The first raffle item is a diamond necklace underwritten by Dooley Oil, and the second item is a $1,000 gas card provided by Laramie GM Auto Center. The winners will be announced at the Gala dinner, but they don't need to be present to win. "Tom and I are confident that we will have a sellout crowd again this year," says Jacque Buchanan, gala co-chair along with her husband, UW President Tom Buchanan. "It seems that tough times bring out the best in our generous Art Museum supporters."